Is this a joke WG? So are you saying because you couldn't buy the lancen c during premium week or whatever you now have to pay $50 dollars more for a skin? Good business practice there. 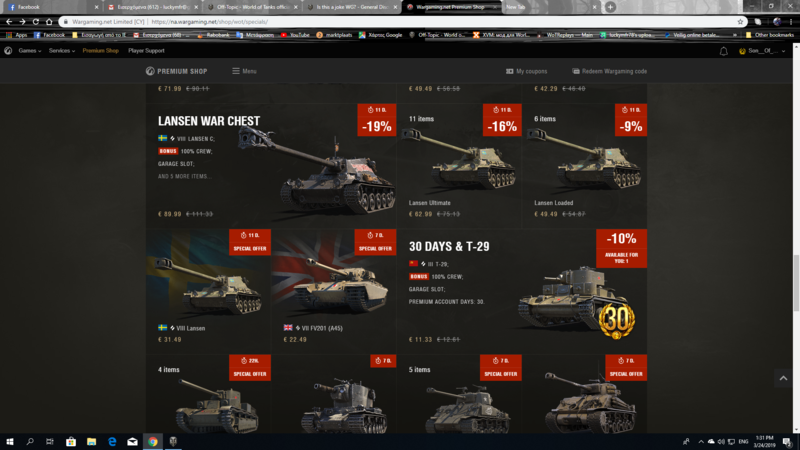 the special skin was ONLY available with the warchest..
ANY other bundle or single purchace of the tank alone, would come WITHOUT the skin..
WG marketing are no dummies. They know people will throw money at their gimmicks. i did saw it in the premium shop yesterday and the day before..
ONLY the warchest would give you the special skin..
they made plenty mistakes with this release, and this is most likely one of them..
the link you suggesting show ALL bundles to have the skin available, when it was anounced that ONLY the warchest will include it.. The presale had the skin in the loaded package, I saw it in the store and it had it. What else must I say. that was a mistake.. and even if you bought the "loaded" bundle, you still WOULDNT have the skin..
this is the reason you see plenty Lancens running around the battlefields but 99.5% of them WITHOUT the skin.. I was one of the "lucky" ones who was actually able to get past the "item not available" and purchase the tank during the "premium pre-sale" event. They did in fact have the skin available on the other two bundles (loaded, ultimate and war chest), only the stand alone tank did not come with the skin. I decided to buy the cheapest option with the skin (loaded bundle). I am a little surprised that the official sale event only has the war chest with the skin. I am not a game developer, so I don't factually know the complexities of rendering art work, but you think they would have an exterior section to the store, for skins and visual customization. You think there would be a lot of money to be had in selling something that doesn't actually require balancing or testing to make sure it wont break the game. I did the same thing, I bought the pre-sale loaded bundle to get the skin. The one thing I did notice, the prices were more for the pre-sale with the skin.